Moving forward may be different than how you imagined. Imagine biking down a street in Manhattan in a designated bike lane. Passing on the left is an endless procession of speedy cabs and limousines. On your right, you flash past hundreds of parked cars. Suddenly, a car door opens, you can’t get around it, so you’re forced to feel the true cost of unaware people. Being asleep and unaware is a big liability. And it’s happening more regularly in the face of these disruptors. It’s someone who offends a colleague with an unwitting faux pas. Or someone who ignores a customer’s concern and loses the sale. It’s someone who is tone deaf to the needs of his team. Or alienates his boss with a flippant comment. It’s a parent who ignores his teenager’s drug problem or a government worker who takes a small bribe. The list goes on and on. The cost of unaware people is just too high to pay these days. Especially when the antidote, becoming more conscious, costs little but returns exponentially. We don’t go deep enough into our human psyche. We spend little time self-reflecting and stay stuck in negative emotions, shackled by old baggage resulting in little understanding of ourselves. Since we don’t have a clear mirror that reflects how we show up in the world, our relationships with others are often stunted. We underestimate the potential of people and ourselves. We live in steel bunkers and can’t see our way out. We don’t challenge our outdated assumptions which limits the power of our expansive minds. Accepting a world of biased minds and limited perspectives causes us to miss opportunities, avoid diversity, and react irrationally to world affairs. We are afraid of change and prefer to avoid the uncertainty around us. As a result, we stay stuck, biased and reactive. We don’t use our natural positive accelerators to push us forward, and trip over our negative hijackers that undermine us. By being too safe, we atrophy and fail to evolve and transform, leaving us standing in place as the world turns. If your view of yourself and the world is too small, you won’t see connections, possibilities or solutions. Staying small and never stepping up is sure to lead to regrets and will undermine your highest potential. It takes courage to unleash your personal power and take responsibility, both of which are central to living a productive life. Organizations are feeling the brunt of our lack of awareness. Markets are changing faster than the ability of organizations to reinvent themselves. There’s a growing gap between the leaders we have and the leaders we need. Executives are being questioned about their ability to lead change in the future. The Gallup Organization reports that seventy percent of employees are disengaged. And executives are deeply worried about the talent gap in society. As a consequence, many organizations are shackled by slow execution, lack of growth, unhealthy cultures, and underperformance. Our communities are also not working well together. Cynicism and diminishing trust are impeding our ability to solve our most complex problems. Broken families, racial tensions, and sexual harassment coupled with trade wars, national tensions, and climate change are exacerbating the situation. This is happening at a time when people across the globe must come together to solve society’s most pressing challenges – human rights, discrimination, the poverty gap, and environmental sustainability. Our world is skidding towards a new economic and social era where the cost of unaware people is too high to pay. We need to wake up. To grasp the true meaning of being conscious, you are going to have to Go Deep and discover your inner world; Think Big to see a world of possibilities; Get Real to be more honest and intentional in leadership and life, and Step Up to your highest potential. 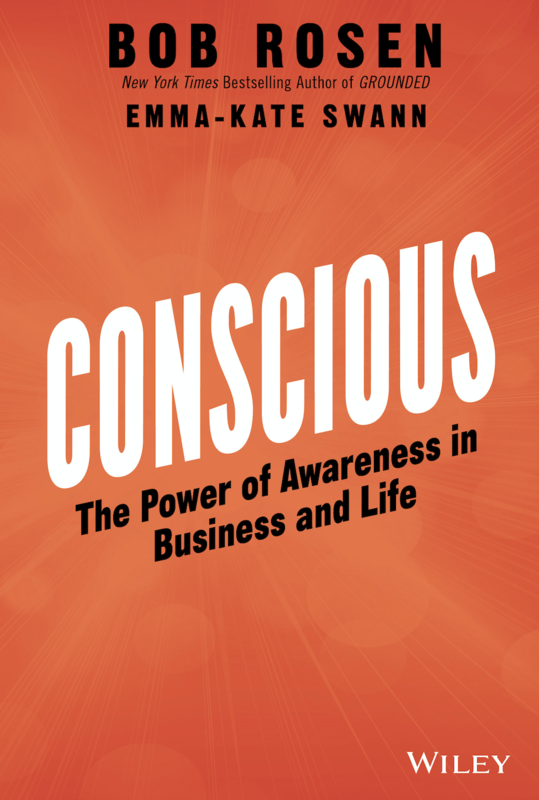 Excerpted with permission of the publisher, Wiley, from CONSCIOUS: The Power of Awareness in Business and Life by Bob Rosen and Emma-Kate Swann. Copyright (c) 2018 by RHR Enterprises. All rights reserved. This book is available wherever books and ebooks are sold. Bob Rosen is the founder and CEO of Healthy Companies International. Emma-Kate Swann serves as vice president of leadership and transformation. Rosen is an organizational psychologist, trusted global CEO advisor and bestselling author of several books including the New York Times bestseller Grounded. Bob Rosen is the founder and CEO of Healthy Companies International. Rosen is an organizational psychologist, trusted global CEO advisor and bestselling author of several books including the New York Times bestseller Grounded.